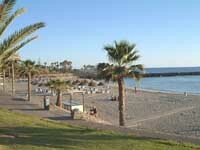 If there is any spot on the globe that enjoys a perfect climate, Tenerife in the Canary Islands might just be it. There is markedly little variation in the average temperatures between summer and winter, and there is only very occasional rain. Add to this landscapes of verdant forests, mountains, deserts, volcanoes, exotic plant and animal life, and spectacular beaches (with black volcanic sand) and you have a true holiday paradise. Tenerife offers the unique experience of swimming and sunbathing on a beautiful beach while just a few miles away snow sparkles on the crest of Mount Teide. The island's central mountain stands at 12,200 feet (3,719m), the highest in Spain, and a cable-car ride to the summit offers unrivalled views of the lunar-like landscape of the volcanic slopes in the UNESCO-listed Teide National Park. The island's capital, Santa Cruz de Tenerife, is an upbeat town geared towards tourism. Its port, where once the first shots of the Spanish Civil War were fired, is today a morass of ferries, jetfoils, and freighters ready to take visitors on various cruises and ocean adventures. Other picturesque towns worth visiting on this picturesque island include Garachico, La Orotava, and Masca, all of which have much to offer travellers.